Iowa Republicans say it’s time for incoming teachers to take a test to see if they’re prepared to be classroom leaders and for high school seniors to take an exit exam to see if they’re ready for graduation. Representative Mike May, a Republican from Spirit Lake who is a retired teacher, says those who flunk the test won’t necessarily to denied a diploma as they might be able to prove their proficiency in certain subject in another way. “(We’re) not suggesting this is just a do-all-or-die test. This is certainly not intended that way,” May says. “…We want to implement this because it gives us a good look at our districts.” The Republicans in the legislature are also pressing for an enhanced “report card” that would let Iowans know how well students in their local school district are performing, and how much is being spent on local schools. Senator Kim Reynolds, a Republican from Osceola, calls it the “Parent and Taxpayer Right to Know Act.” “We need to do what we can to keep parents and taxpayers fully informed on the process and we need to make sure that we are providing for them adequate tools that they can evaluate the performance of the school system and be able to really hold their educators and local officials accountable,” Reynolds says. The Republicans are also reversing course as a party and suggesting it’s time for statewide content standards for what is taught in each grade level — in both public and private schools. Representative Jodi Tymeson, a Republican from Winterset, says Republicans have been hearing from “lots of Iowans” who’re upset with the status quo. 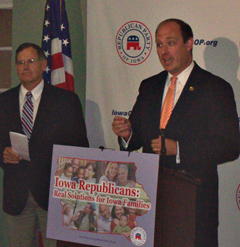 Iowa Democratic Party chairman Michael Kiernan finds the G.O.P. call for statewide education standards ironic. “When they say they’ve come forward with a new plan and a new initiative, one of the pieces of their proposal is the same one that they shot down,” Kiernan says. Republicans maintain their proposal would be different and give schools greater flexibility in meeting the statewide standards. The Iowa Democratic Party’s chairman also dismisses the idea of testing new teachers and high school seniors awaiting graduation. “This seems to be a reach to the past and some of their failed policies before,” Kiernan says. “Frankly, it smacks of No Child Left Behind.” President Bush signed the “No Child Left Behind Act” in 2001. Under the federal education standards outlined in that law, 293 Iowa schools are now on classified as “in need of assistance.